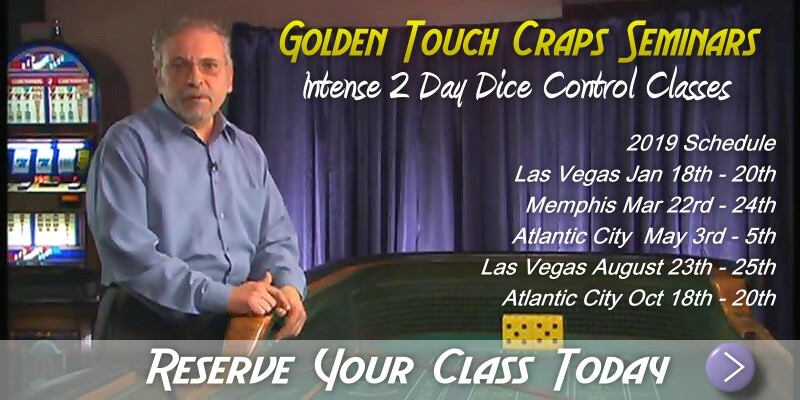 ﻿ Now Booking Reservations for Golden Touch Dice Control Craps Seminars! Primer Class $1595.00. 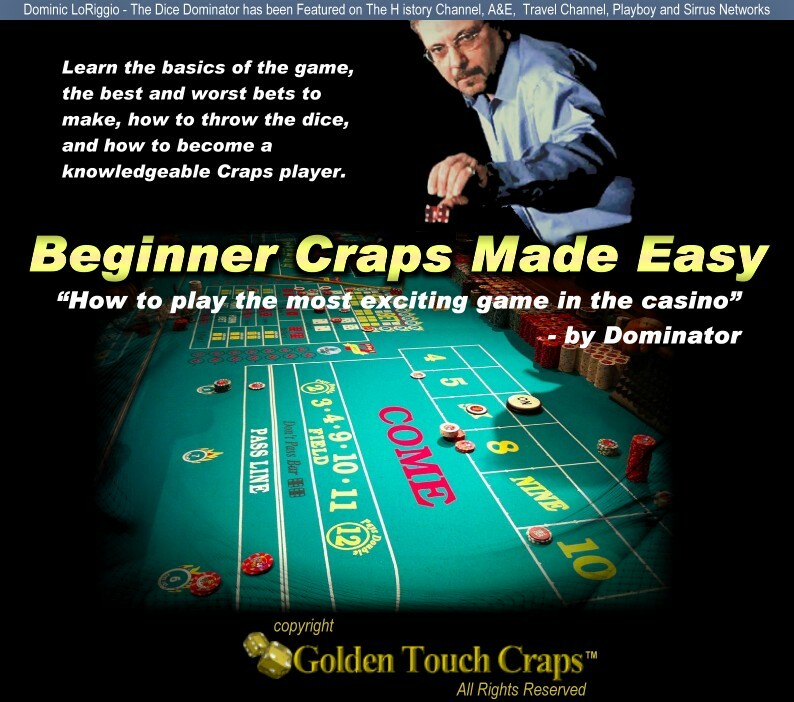 Let the greatest dice controller in the world, The man with the Golden Arm, The Dominator, teach YOU how to WIN at craps. Dominator is listed as the 8th best gambler of all time, http://www.gamblers007.com/top-10-famous-gamblers-who-beat-casinos/ Give him a call at 866-SET-DICE for a personal consultation on your goals when you go to a casino. You can also register for a seminar below. Two-day dice control course (9:00AM to 5PM on Saturday; 9:00AM to 4PM on Sunday): You will learn all the elements of a Golden Touch controlled throw in an intense two-day class. Open house is Friday at 2:30, All are welcome and should attend. You've been practicing and playing. Make sure you have not let any little (or big) mistakes into your controlled throw. Let the GTC instructors watch you and comment on where you are now. This is an intense throwing course to make sure you are doing it all right! Note: these sessions are for prior GTC students only. Two teachers per one student and a mentor taking notes that will be given to you! The best athletes have coaches to watch them and to offer advice on their mechanics. Our one and one-half hour tune-ups are for GTC controlled shooters who wish to have their throw analyzed by our instructors. No more than four students per regulation craps tables. Note: these tune-up sessions are individually scheduled on the noted dates, and for prior GTC students only. Please call to make a reservation. Did you know it’s possible to WIN at Video Poker? Yet most players who play Video Poker are losers! NO MORE! Golden Touch wants to make you a WINNER at another game that is beatable. Lunch - A sit down hot lunch with Dom and all his instructors and your class mates. A great way to talk about craps away from the classroom and to make arrangements to meet up with friends! Golden Touch Dice Control Two-Disc DVD. Watch Dominator and Bill "Ace-Ten" Burton demonstrate all aspects of the Golden Touch controlled throw. This wonderful DVD is a great follow up addition to the intense live learning done in the Golden Touch dice control class. Retail price is $299 but those registered for the Golden Touch dice control class pay only $150. Call TOLL FREE: 1-866-SET-DICE, or 1-886-738-3423. I enjoyed being able to watch different coaches throw. The course is very well done, very professional.